The Harley-Davidson and V-Twin motorcycle calendar is a tribute to American motorization at is finest. Yet, it�s far more than a batch of great pictures. It�s a collection of brilliant, classic V-twins and hogs that have been restored to their pristine condition by hogsters that love the medium as much as we do. The photographer not only captures these rides in amazing detail. You get the name of the hog�s owner, the engine size and year of the model. The calendar is an impressive reminder of not only why these vehicles have endured, but why we want them to. This calendar makes a perfect gift for every hog lover, from dreamer to pro rider. 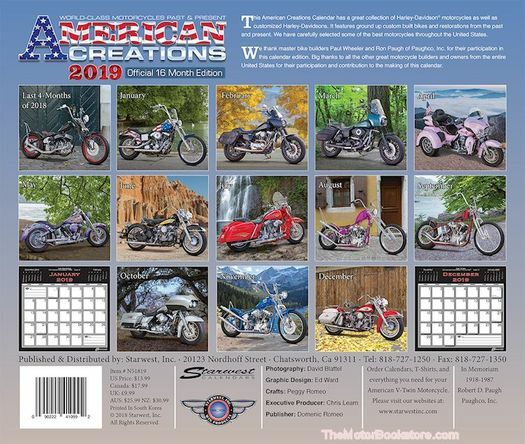 The Harley-Davidson and V-Twin motorcycle calendar is published by Starwest, Inc., a leading provider of Harley parts and accessories. There is no greater resource for getting info on these machines. It�s a sure bet they poured their knowledge and affection for these machines here. NOTE: Price includes Free Shipping. 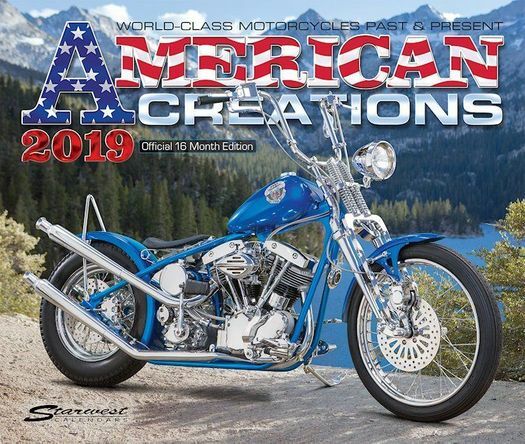 Ask a question about American Creations Wall Calendar 2019.